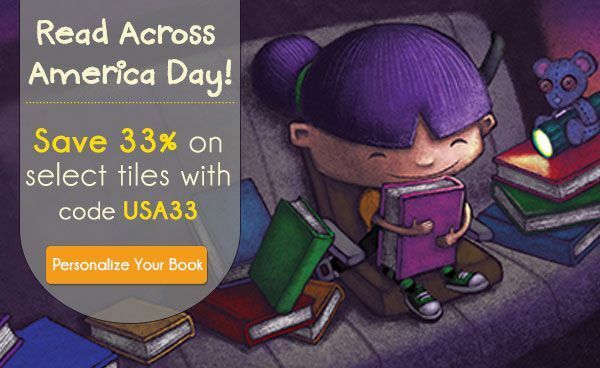 Celebrate Read Across America Day with Put Me In The Story and discover where you can go with a good book! Happy Read Across America Day from Put Me In The Story! Let's honor this nationwide reading celebration with unique, personalized books that will get your kids excited about reading and writing. Don't forget to read loud and proud with your little ones today…and every day, of course. For fun reading tips to celebrate Read Across America Day, scroll down! An ordinary trip to the library turns into an imaginative, literary adventure! As soon as you open the pages of this book, your little girl will be flying as Peter Pan to the children's section of the library, searching for the book that is juuust right as Goldilocks, setting off on a legendary dive as Captain Nemo, and more. Hooray for You! is a celebration of "you-ness"—the grand sum of body, mind and heart that makes every person truly unique! The title of this vibrantly illustrated children's book expresses everything that your child wants to hear. I Believe in You encourages your child to see their own strengths and talents as you do. • Reading a book with rhyme or song! Books with rhymes are great to read out loud, and are especially helpful for those younger kids just starting to read. • Reading as a family, reading often, and reading aloud! Helping your child develop into a lifelong reader starts at home. • Reading books that will take you somewhere you've never been today. It can be a book set in a unique location or an imaginary place. • Embracing imagination! Imagination is one of your child's most powerful tools. Nurture it. Play dress up with inspiration from your child's favorite story. This will make reading the book that much more fun! • Creating a colorful reading chart and putting together a realistic plan for you and your children to read more. Commit to your reading plan by taking a pledge together. • Choosing books to read that celebrate reading, imagination, and your child's unique traits. * Use coupon code USA33 to take advantage of this offer and receive 33% off our regular price shown on the website. Your discount will be applied to the following titles: I Believe in You, Hooray for You!, More Bears!, and Isabella:Star of the Story, and will be calculated at the time of checkout. Shipping and taxes are excluded from the discounted amount. Offer expires 3/05/14 at 11:59pm CST.